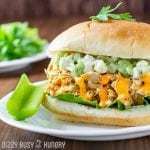 So easy, versatile, and tasty, this Crock Pot Pulled Buffalo Chicken Sandwiches dish is one of my favorite chicken recipes, perfect for feeding my family on busy weeknight or a serving a crowd on the weekend! Place chicken in the slow cooker. Pour the buffalo sauce over the chicken, cover, and cook for 6-8 hours on low. Mix together the celery, blue cheese crumbles, and blue cheese dressing. Refrigerate until ready to serve. When the chicken is done, remove it from the crock pot and shred it with a fork in a medium bowl. Add some of the liquid left in the crock pot - about 1/4 cup, more or less to taste, but not too much or your sandwiches will be soggy. Distribute the chicken over the 4 rolls. If desired, drizzle some additional buffalo sauce over the chicken. Top with the celery relish and serve. To prevent the rolls from becoming soggy, place a leaf of romaine on the bottom half of the roll before adding the chicken.